The Anar Sagar Lake and Bund from the British Residency, Ajmer. 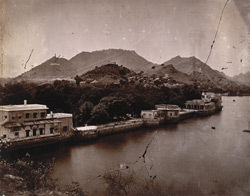 bl.uk > Online Gallery Home	> Online exhibitions	> Asia, Pacific and Africa Collections	> The Anar Sagar Lake and Bund from the British Residency, Ajmer. Photograph of the Anar Sagar Lake and Bund seen from the British Residency in Ajmer, taken by O.S.Baudesson in the 1880s, from the Archaeological Survey of India Collections. Printed from a broken glass plate. The town of Ajmer lies at the foot of Taragarh Hill on the edge of the Ana Sagar, an artificial lake. The Mughal emperor Shah Jahan (r.1627-58) built a row of white marble pavilions along the embankment or bund of the lake. This is a view of the pavilions with the Daulat Bagh beyond. In 1818 Ajmer was annexed by the British after a treaty with Daulat Rao Scindia; this photograph is taken from the British Residency in Ajmer.